The spoookily versatile Sistermoon Minidress - everyday Witch Wear from Moonmaiden! <br> <br> It's sleeveless, with straps and a rounded neck; the body of the dress is panelled, and flared, loosely fitted at the waist with a bias-cut skirt. It's shown here in black and white, but is available in all of our crushed velvet shades! 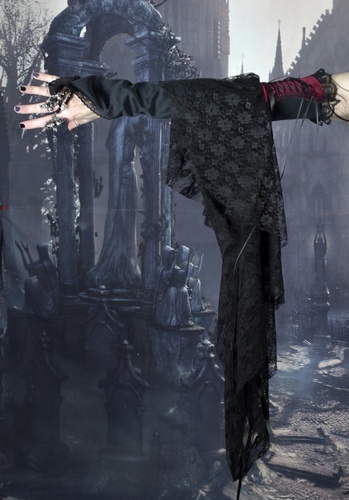 <br> <br> It's worn here with our Walpurgis Gloves and Eviscerella Gloves. The spoookily versatile Sistermoon Minidress - everyday Witch Wear from Moonmaiden! It's sleeveless, with straps and a rounded neck; the body of the dress is panelled, and flared, loosely fitted at the waist with a bias-cut skirt. It's shown here in black and white, but is available in all of our crushed velvet shades! It's worn here with our Walpurgis Gloves and Eviscerella Gloves.